Fast Healer Recovers M.D.C. at a rate of 2D6 per 12 hours. Prehensile Tail All Grackle Tooth have a long (12-15 foot), tapering, prehensile tail. This adds 1 extra attack per melee round if the tail is used; it can hold and use most hand held melee weapons to strike and even handguns (a weapon fired by the tail is at -3 to strike, even with an Aimed Shot.) If damaged or lost, their tail will also fully regenerate at a rate of 1 foot per month until its full length is reached. Desert Hardened Completely impervious to the negative effects of carcinogens and heat. Survival Knife 1D6, kept in an ankle sheath so he can reach it with his tail. Fragmentation Grenade 2D6, 20ft area of effect, ×8, kt on bandolier. Payload: 20 individual shots. ×7 extra e-clip. Payload: 20 per e-clip, cannot use long e-clip (×7 extra e-clips). Damage: 5D6 S.D. per burst of flame (counts as 1 melee attack) and a 01%-75% likelihood of seeting combustible materials aflame. Payload: 20 bursts per 1 canister of fuel. ×2 extra cannisters. Damage: 5D6 S.D. per single round, but can only fire in bursts; 1D6×10 S.D. per short burst (12 rounds fired, counts as 1 melee attack); or 2D6×10+20 S.D. per long burst (36 rounds fired, counts as 3 melee attacks). Payload: 300 short bursts (×2 extra 3600 round belts). Armored Trench Coat 25 M.D.C.. Appears to be a normal trench coat, but has plates of M.D.C. armoring stitched inside, weighs 20 lbs. -10% mobility for civilians, -5% mobility for those trained in combat (no penalty for physical skills like Climbing.) Covers 40-60% of the body. Helmet (30 M.D.C.) comes standard. Black Market Items 3,000 credits worth. None, though Grackle Tooth tend to avoid implants it is not unheard of. Insanity(s): Hysterical Aggressive Reaction (Trigger: Domestic/Child Abuse). It should also be noted that this character absolutely does not drink alcohol. Sentiments Toward Coalition State: Wariness; he knows that he’d be killed by a CS soldier on sight (in fact, he thinks that’s how he’ll die), so he tends to avoid their frequented roads. He is not above attacking them if he sees an opening that he or his team can exploit to take them down (after all, their gear is worth a chunk of credits). Sentiments Toward D-Bees: Indifference; unless they’re challenging him or he’s challenging them, they’re just another person. He tends to respect the stronger and mechanically inclined races more, though. He will always show respect and care toward women and children, no matter the race. Sentiments Toward Humans: Indifference; they’re typically not strong enough to do more than annoy him and a fight with them would be a joke. In big groups, though, he tends to avoid them – humans are crafty, adaptable, and there’s a whole lot more of them than there are of him. He will always show respect and care toward women and children, human or not. Cold Blooded Unsuited to cold weather and finds it uncomfortable; -5% to all skill performance and -1 to all combat bonuses if forced out into temperatures 35°F or lower. Freezing temperatures feel like below 0°F to a Grackle Tooth. Size and Reputation Due to their large size, some places and objects can be unaccommodating (doorways, beds, smaller weapons, fine tools, etc. ), and are uncomfortable but not impossible to use. Their size and reputation as fearsome warriors also makes them prime targets in an attack. Background: A direct descendant of a Tolkeen Army Staff Sargeant, Christopher (named after his Father) was very proud of his heritage and wanted to join the war effort when he was old enough. He didn’t see much of his Papa, who was rarely on leave, and spent much of his time growing up with his Mama, Hera, a learned scholar who loved music and reading and passed these passions on to Chris. For a long time, his childhood was idyllic, he was safe and happy with his Mother, proud and reverent of his Father, and they wanted for nothing more than spending time together. But then Hera got sick. Her health deteriorated rapidly and they were unable to find a treatment that could fight off the disease without being fought by her dying body as well. Within a year, she passed away, leaving behind a distraught child and lover. His Papa had to leave the military, they had no other known family to care for his son, and with the loss of his passion and his love, began to drink. At first it was tolerable, a couple of nights a week at the bar while the boy stayed with a friend. But as the pain and bitterness grew, so did his thirst for alcohol, and he would come home blackout drunk if he came home at all. It was during this time that he began to lash out at Chris (the spitting image of his Ma and just so proud of his Pa’s abandoned career), and the hurt became worse with time. Chris, hardened to the abuse and now called “Topher”, spent more time on the street and avoiding his Father and well-meaning friends than he did at home. He learned how to use a gun out of fear and necessity – and on the night when he finally pulled it on his Father, the man left and he never saw him again. He found out later that his Father rejoined the military, he doesn’t care to know whether he’s sober or not. As soon as he was of age, Topher took off, wanting nothing to do with his Father or hometown and the bad memories involved. He wandered a bit, being run out of some towns for his monstrous appearance and only briefly staying in others. He finally encountered a Mercenary outside an inn (he avoids taverns and bars like nobody’s business) who offered him an interview with the leader of their group. And he’s been there running jobs that utilize his size and talent with weapons ever since. Family Tree: Mother is Hera Talonmaw, a Rogue Scholar who died of an extremely aggressive bone cancer when Topher was 12. Father is Christopher Gearweld, a decorated Staff Sargeant of the Tolkeen Army who specializes in mechanics and communications and has since gone back to work in the military. Topher does not like his Father (though he hides behind all of the war stories he used to hear) and is adamant about not seeing or speaking with him. The Gearweld bloodline was rather known for their Operators while the Talonmaw clan got their start from a long history (back on the homeworld, even) of being mighty warriors. Arms: Grenade Launcher Rifle: 1D6×10 per grenade to 10ft radius, 1200ft. Machine Gun: 1D6×10 short burst or 2D6×10+20 long burst (counts as 3 attacks), 3000ft. Military Flamethrower: 5D6 per burst, 01%-75% chance of lighting flammables, 60ft. Wilk’s 320 LASER Pistol: 1D6 M.D., 1000ft, +2 aimed shot. Wilk’s 447 LASER Rifle: 3D6 M.D., 2000ft. Armored Trench Coat: 25 M.D.C. Helmet: 30 M.D.C. Abilities: Horror/Awe Factor 12, prehensile tail, MDC recovery of 2D6 per 12 hours, impervious to heat and carcinogens. 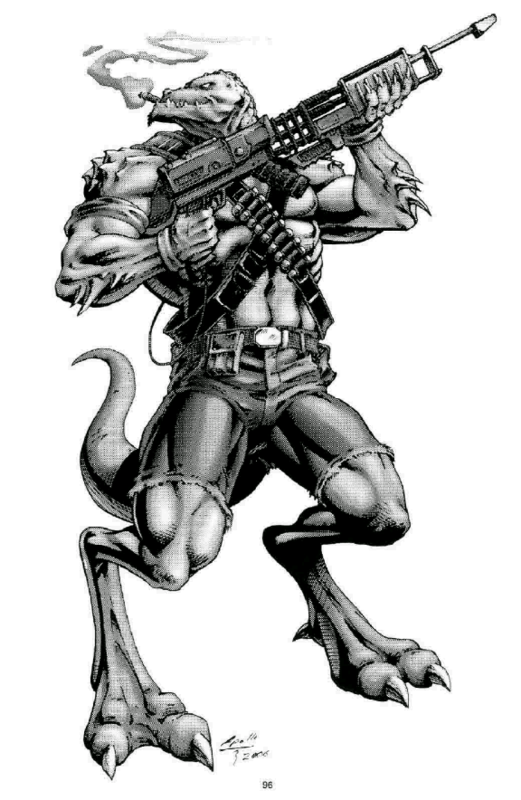 This entry was posted in Character Creation, RIFTS RPG, Role Playing, Toon Tuesday and tagged character creation, grackle tooth rcc, merc soldier occ, Palladium Books, Palladium Rifts, Rifts RPG, toon tuesday. Bookmark the permalink.